The European Agricultural Fund for Rural Development: Europe Investing in Rural Areas, Managing Authority PROW 2014-2020 – Ministry of Agriculture and Rural Development. Project 'The Crocus Event – an Innovative Approach to Tourism and Ecology in the Commune of Kościelisko', implemented by the Local Tourism Organization in Kościelisko Commune and co-financed from the E.U. Funds under Community Led Local Development under LEADER programme. PROW 2014-2020. Where are crocus flowers growing now? The crocus blossoming phenomenon is one of the spring symbols of the Commune of Kościelisko. Every year this wildlife phenomenon attracts more and more visitors keen on nature and beautiful views. Crocus protection, conscious tourism and education are all important to us. We value the convenience for our visitors as well. Take a walk to see #hokuskrokus! The map presents other places where crocus flowers will be found. They are less crowded but as quaint as the Chochołowska Valley. Admire and take pictures of crocuses from mountain trails. Do not enter the clearings in order not to trample on crocus flowers. Do not pick flowers, a photo of crocuses will be a great memory. Do not park your car on crocus flowers. Use toilets in mountain shelters, there are mobile toilets too. Be a crocus guardian. If you see improper behaviour, act! Enjoy the pictures taken by a renowned Tatra photographer, Adam Brzoza. 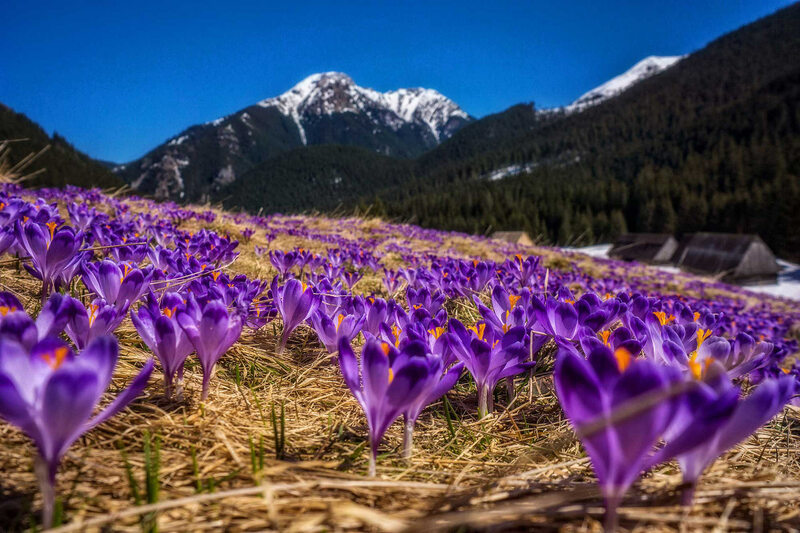 The crocus population in Polana Chochołowska, which is the richest in these flowers and one of the largest clearings. Monday - Friday: 8 a.m. – 4 p.m.
Saturday: 10 a.m – 4 p.m.